When I was just starting out as a photographer, portraits and fashion photography was what I wanted to do. Food photography was a new topic that was introduced to us at Photography School. That’s where I also learned about the concept of a food styling. A food stylist makes the food look perfect and tempting. Food styling means knowing exactly how to place a basil leaf on a Margarita, how to make the ice-cream look freezing cold and delicious, etc. Esther Amanna is a brilliant Food Stylist who taught us these things at Shari Academy. There are endless restaurants in Mumbai that keep popping up and these new restaurants need to show their menu in pictures, to generate a buzz. Most restaurants are ditching phone pictures and hire professional photographers to take pictures of their cool interiors and décor, the different cuisines on their menu and the chic presentation of their food serving. A couple of years ago, before I turned into a full time baby and family photographer, I was called and asked about doing a barter deal for food photography. A barter deal means getting free dine-out vouchers from restaurants in return for photography services. In such deals, the pay is low but they’re a great way to start out in the field, work with brands and make a portfolio. Since, I was in the beginning stages of my career and exploring my options, I said yes and was hired through an agency called DSPR. At first, it was enjoyable, experimenting with my camera, learning and honing my skills. After a couple of barter deals though, it started feeling monotonous. I had to work only with what I had and couldn’t use any props or backdrops other than what was provided. Some times, I’d even rent props with money from my own pockets, to get the kind of photographs I wanted. I would get a little restless with all the creative ideas I had, that would go unexpressed. In these photo shoots there was also no budget for a light person, food stylist or any sort of extra help. Eventually, all those reasons made me not follow this path. During my time as a food photographer, I worked with Grandmama’s Café, Spice Klub, Desi Klub, Chine One, Quattro, The Rolling Pin, PDT, Boveda & Café Free India. I also worked with California Pizza Kitchen, which was a paid project and not a barter deal. It was wonderful but working with a big brand meant following their guidelines and certain restrictions. As much fun as I had with dabbing at food photography, I found my niche in clicking people and portraits. That’s where my heart was and that’s where I found my passion. I still like to create foodart images, but I do that for myself and not for commercial purposes. I also take inspiration from food photography in the kind of baby photography I do now, in the colours and textures I use. 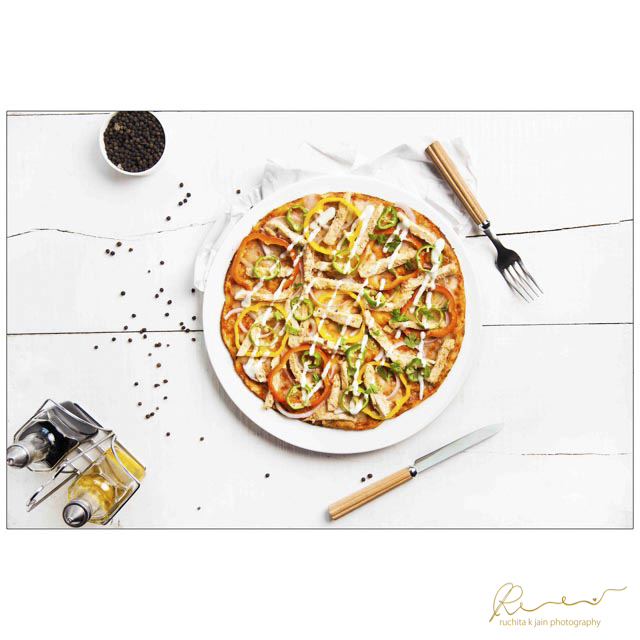 Food photography may not have been something I followed, but it certainly added to the photographer that I am today.